The U.S. Navy’s newest and most technologically advanced surface ship, future USS Zumwalt (DDG 1000), pulled into Naval Station Norfolk Wednesday for another port visit as part of its three-month journey to its new homeport in San Diego. “Training is the foundation of every operation we perform in the Navy, and it is our job to ensure we use the time in Norfolk to get as much quality training as we can. Successful training pays dividends for sailors out at sea,” said Kirk. “Our first ever port visit was to Newport, or the U.S. Navy's surface warfare center of gravity, where we were able to host tours and give our schoolhouse surface warfare officers and other distinguished guests a look at the future of the surface fleet,” Kirk said. USS Zumwalt will be formally commissioned during Fleet Week Maryland in Baltimore, October 15. “Each day that passes is one step closer to commissioning and one step closer to joining the fleet. The crew is ready to face the challenges in the coming months and excited to be operating this fine warship,” Kirk said. 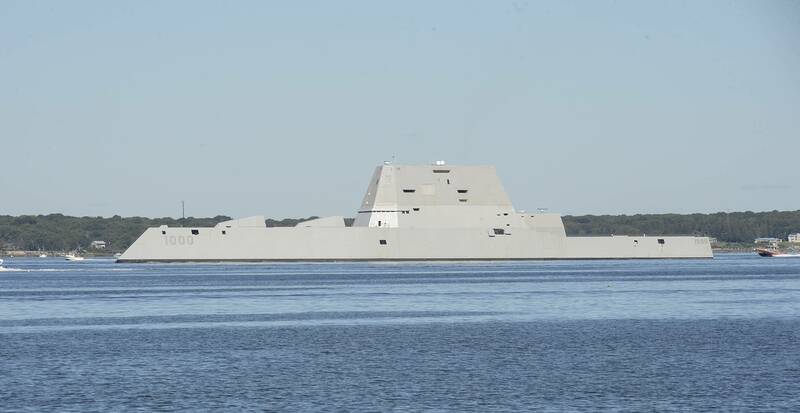 Named for Adm. Elmo R. “Bud” Zumwalt Jr., former chief of naval operations (CNO) from 1970 to 1974, the Zumwalt-class features a state-of-the-art electric propulsion system, a wave-piercing tumblehome hull, stealth design and the latest war fighting technology and weaponry available. In addition to its advanced weapon and propulsion systems, Zumwalt is much larger than today’s destroyers. 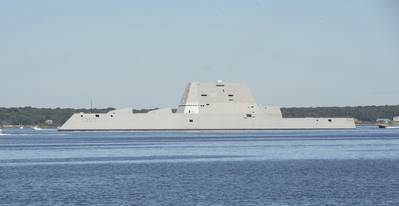 At 610 feet long and 80.7 feet wide, Zumwalt is 100 feet longer and 13 feet wider, and its flight deck is 93 percent larger than an Arleigh Burke-class destroyer.